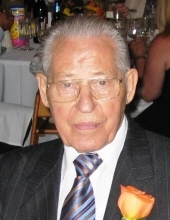 Antanas “Tony” Pauzuolis, June 27, 2018. Age 96. Devoted husband of the late Emilija Pauzuolis. Loving father of Rimantas(Patricia), Algirdas(Judith) and the late Linas(late Carrie) Pauzuolis. Cherished grandfather of 5 and great grandfather of 4. Beloved brother of Joana Gedrimas and family in Lithuania. Antanas was a member of the Lithuanian Scouts. Director of the Lithuanian youth center in Chicago, IL., Knights of Lithuania Lodge C-112, and former treasurer of the Lithuanian Partisan’s Society. In lieu of flowers, Memorial Offerings in Anthony's name may be made to the Lithuanian Youth Center or to the Alzheimer's Foundation. A†A ANTANAS PAUŽUOLIS mirė 2018 m. birželio 27 d. Elgin, IL. Gimė 1921 m. lapkričio 30 d. Panevėžyje, Lietuvoje. Gyveno Hoffman Estates IL, anksčiau Čikagoje, Marquette Parko apylinkėje. Nuliūdę liko: sūnus Rimantas, marti Patricia; sūnus Algirdas, marti Judith; 5 anūkai, 4 proanūkai; sesuo Joana Gedrimienė su šeima Lietuvoje. A. a. Antanas buvo vyras a. a. Emilijos, tėvas a. a. Lino ir uošvis a. a. Carrie. Buvo Partizanų globos fondo finansininkas, priklausė Lietuvos vyčių kuopai C-112, darbavosi Jaunimo centro taryboje, buvo aktyvus Lietuvos skautų sąjungos narys, ilgametis „Draugo” bendradarbis. Vietoj geliu prasom aukoti Jaunimo Centras arba Alzheimer Foundation. Velionis bus pašarvotas sekmadienį, liepos 1 d., nuo 3 val. p. p. iki 8 val v. Petkus Lemont laidojimo namuose, 12401 S. Archer Ave. (arti Derby Rd. ), Lemont. Laidotuvės įvyks pirmadienį, liepos 2 d. Iš laidojimo namų 9 val. ryto velionis bus atlydėtas į Švč. M. Marijos Gimimo bažnyčią, 2700 W. 69 th St., Chicago, IL, kurioje 10 val. ryto bus aukojamos šv. Mišios už jo sielą. Po šv. Mišių velionis bus palaidotas Šv. Kazimiero kapinėse. Kviečiame visus draugus, artimuosius ir pažįstamus dalyvauti laidotuvėse. Liūdinti šeima. To send flowers or a remembrance gift to the family of Antanas Pauzuolis, please visit our Tribute Store. "Email Address" would like to share the life celebration of Antanas Pauzuolis. Click on the "link" to go to share a favorite memory or leave a condolence message for the family.